I have an exciting giveaway to share with you all today, thanks to Entertainment Marketing Group and Amazon Publishing. Nancy Pearl, America's favorite librarian, and Amazon Publishing have launched a line of her most beloved books which are currently out of print. I don't know about you, but I am looking forward to reading some of these highly recommended reads. Book Lust Rediscoveries will publish approximately six books a year and will be made available for sale in print editions via Amazon.com and as audiobooks via Amazon.com and Audible.com, at bookstores, wholesalers and libraries nationwide and as eBooks in the Kindle Store. Each book published will come complete with an introduction written by Nancy Pearl, discussion questions that would be perfect for book clubs, and suggestions for other titles that readers may enjoy. 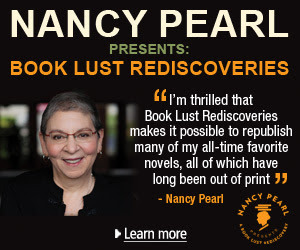 Nancy Pearl has committed to donate a portion of the proceeds from the sales of books in the Book Lust Rediscoveries to the Nancy Pearl Endowment for Public Librarianship at the University of Washington’s Information School. How great is that? This giveaway is open to US readers only and the deadline is October 20th. Be sure to check my giveaway rules and good luck! Thank you! This is a great concept! Love the idea of bringing back beloved out-of-print stories -- fab!